Last week I was sitting at a traffic light when I noticed the car in front of me had this sticker in its back window. 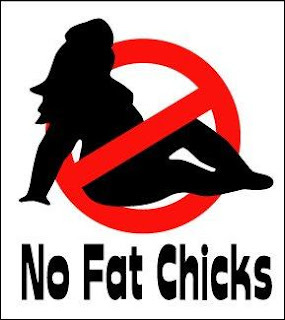 I stared at it as I followed the car with the young twenty something driver and his buddy down the street, trying to comprehend what I was seeing and wrap my brain around the fact that they were announcing to the world the fact that they didn't want fat chicks in their car. I was heartbroken for the twenty something gals that would see this sticker. There is an "ism" I call Fatism. This is when we hold non-skinny people responsible for the prejudices directed at them. I was a size 6 until I was 30. Then I gained over 20 lbs in two months and was shocked and amazed to see how differently people looked at me and treated me. "One of the hardest things about trying to loose weight can be the sense of failure that comes when we have setbacks from reaching our goals, we take failure personally, attributing it to a character flaw- lack of discipline, lack of willpower, inability to see things through. The internal guilt trip can come up with endless personal shortcomings. A constant battle with weight creates psychological baggage. The baggage comes from a variety of sources, whether it's from the scrap heap of failed programs that we have tried and ultimately failed at or the mental beatings we give ourselves for lacking the discipline needed to loose weight." What struck me about this bumper sticker last week, was that as I have studied metabolism, ancestral health, Paleo, and Low Carb Lifestyles, I have learned that there are many ever-changing and intermingling factors that can cause a body to over store fat, such as: genetics, our mothers diets when we were in utero, gut health, illness, food addiction (intentionally engineered by food companies), medications, emotional eating, food sensitivities, genetically altered food, body set points, food allergies, leptin resistance, glucose/insulin levels, preservatives, stress, hormones, sleep issues, inflammation etc. etc. So we fat chicks are not flawed in character but in need of individual solutions that will help us loose body fat (if that is what we want) and feel better, and that solution for the vast majority will not come in a one-size-fits-all package called eat less~exercise more. The more I learned about these factors the less I internalized and blamed myself. My wish is that the standard oversimplified story of weight that we are constantly being fed by government and health organizations be sidelined in favor of a less political, more truthful and accurate story that includes all the intricate complexities. My other wish is that the voices in our head speak to us in a much kinder way, more often, despite the hate and misinformation we may be exposed to. An important topic! Please check out the work of Reagan Chastain at Dances With Fat and Linda Bacon's Health at Every Size. I follow a Paleo, low carb diet and am obese; however, people feel compelled to "educate" me about diet and exercise. Reagn is a worldclass dancer and Linda has many resources. I agree. It is a very important topic. Thanks for the suggestions. I agree with Linda, awesome health comes in many sizes.